Malden Center is a unique transit oriented mixed-use development that includes 320 residential apartments, 45,000 square feet of office space that will become the new Malden City Hall, and more than 22,500 square feet of street retail. Over 30,000 square feet of custom resident amenities will be located at Jefferson at Malden Center. Inside the building will be 9,000 square feet of amenity space, including a fitness center, a yoga room, a solarium, a club lounge, conference space, and gaming areas. Outside will be over 21,000 square feet of space including two amenity decks. One amenity deck will contain a pool, pergolas and cabanas, a fire pit, an outdoor gaming area, an outdoor kitchen, and a lawn for yoga and other outdoor activities. The second amenity deck will offer a fire pit and seating area for residents to sit and enjoy the remarkable views of the Boston skyline. 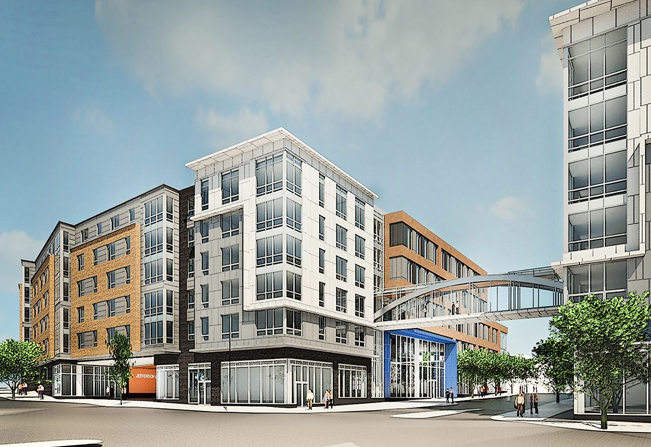 Jefferson at Malden Center will construct three new wood-framed buildings connected by a sky bridge. Each building at Jefferson at Malden Center will include ground-floor retail. The development’s South Building will feature 247 apartment residences, in addition to a 330-space ground-level parking garage. 240 garage spaces will be reserved for Jefferson at Malden Center residents, and 90 spaces will be used for the development’s ground-floor retail. An additional 73 apartments and the new Malden City Hall office space will be located in Jefferson at Malden Center’s North and Northeast Buildings.